To some people, the Chinese are probably the world most greediest gluttons. Every Chinese New Year, you can see hoards of people buying food stuffs like there is a famine or some emergency food shortage coming. I too have wondered where those extra cans of foods, mountain loads of oranges, hills of cookies and cakes and piles of meats go to? Well, one doesn’t need to wonder because they got flushed down the toilets, right? But Chinese New Year celebrations is not complete without pigging out on foods. Loads of them. The best foods are those seasonal ones which are imported from China. 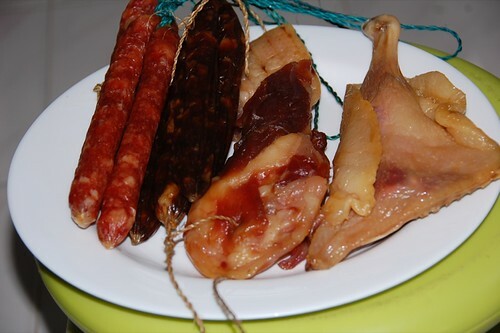 Things like Mandarin oranges which will give us toilet run, waxed meats and air dried meats which will give us cancer later in life and dried seafoods like sea cucumber, oysters, scallops, sharksfin…..which will also give us cancer. Hahaha. Who cares, eat first, die later. I love steaming those dried sausages and waxed ducks or just throw them into my rice while cooking. There are two types of waxed ducks. 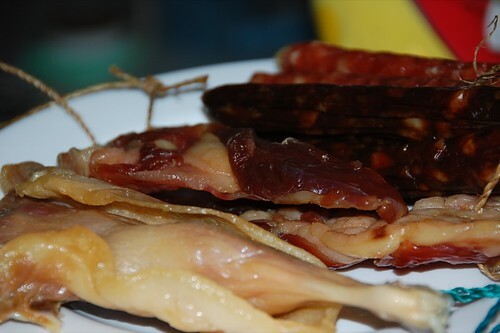 The duck breasts are sweet flavoured meats while the duck drumsticks are very salty meats. 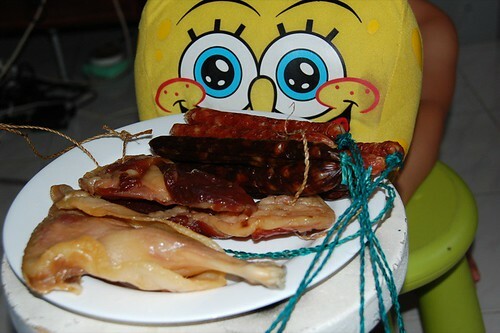 Normally, I make lap mei fun or waxed duck rice by putting in liver sausages, normal Chinese sausages, both types of ducks, dried shitake mushrooms and some garlic. Colour the rice with a bit of dark soya sauce and you get a heavenly pot of rice. Whenever I organise Chinese New Year meals for the in-laws (which have about 30-40 people), I will cook a few pots of this rice and it will keep them happy and talking about my rice until the following years. Normally, I store the waxed ducks and sausages in the lower drawer in the fridge to avoid the meats turning rancid in our hot and humid weather. Of course, if you live in China where it is minus zero and dry, you can hang them around your house. However in Malaysia, it is safer to keep them in the fridge. I also like to buy these early because they are normally snapped up fast and you cannot get anymore stocks nearer to Chinese New Year. Heh, typical kiasu China woman, I am. Hi Lilian, can I check if Kwong Tuck’s stock for lap cheong stuff is from China or HK this year? I wanted to buy, but my grandma is against eating China foodstuff now, esp pork. Fok Weng (ç¦è£) behind the Chowrasta market do has some waxed meat that they claim they make/dried it themselves behind their shop. Looks very tasty but I did buy any, just bough the black mushroom & dried long-gan. boohoohoo…waaaaa….yr description of the lap mei fun makes me think of those good ole days when my mom makes them during CNY eons ago. hubby n dotter hates the smell of lap mei n everytime i steam them i get 2angry faces breathing down my neck. err…when u cooking the lap mei fun arr? can come tumpang or not?? ?